The time has come again, as it does every year, to make your holiday shopping list and check it twice. Hopefully, as you are checking off the family and friends’ wish lists, you’ve made some of your purchases at our fine, Cayuga County retailers. Many of our large retail businesses will have amazing one-day-only Black Friday and Cyber Monday deals, but you won’t want to miss out on the special discounts, giveaways, and special events offered by our local shops this Small Business Saturday. This year, Small Business Saturday is November 24, and many of the small retailers in our community will be participating in the celebration. Head to our downtowns and local stores to take in the festivities and take home unique holiday gifts for family and friends. This “shopping holiday” isn’t only about shopping. It is about supporting our local businesses that generate a sustainable community. Every dollar you spend locally, supports this community. Shopping and buying local allows local businesses to thrive and reinvest their dollars in their buildings, products, employees, and other local suppliers. Also, shopping local means that a portion of your sales tax dollars get put back into our community. Sales tax revenue helps local governments pay for services and programs, which helps to offset property taxes. Many of these local, small businesses have benefitted from our assistance at the Cayuga Economic Development Agency (CEDA). When Mike and Pam Parks wanted to turn their hobby of building, fixing, and restoring bikes into a small business, L.B. Lightning Cyclery, a CEDA Specialist reviewed their business plan, connected them with local events that could help them boost their business, introduced them to local professionals and potential clients, and tied them in with the Graphic Design & New Media class at Cayuga-Onondaga BOCES to have a logo designed. CEDA worked with Matt Peirson prior to the opening of his hugely successful Simple Roast Coffee Company on Grant Ave in Auburn and continues to assist him with the growth and expansion of his business today. Over the last few years, we have assisted hundreds of individuals from Fair Haven to Summerhill explore the possibility of owning their own business. Our Specialists can assess business ideas and form business plans with market research, financial projections, and finding funding. Most importantly, we have a lot of cumulative knowledge of the area in all industries. If we don’t, we can connect the entrepreneur with the resources they need to start or grow their business. Contact Derek Simmonds to set up an appointment and start making your business idea a reality. CEDA’s business development services are always free and confidential. So, where can you find information about local, small businesses and Small Business Saturday deals and events? Stop by the Cayuga County Chamber of Commerce’s offices at 2 State Street, Auburn, during regular business hours to pick up a free copy of the Community Guide & Member Directory, which lists Chamber Member businesses by category and can help you plan your local holiday shopping adventures. Also, check out the Citizen’s Holiday Gift Guide for plenty of ideas, coupons, and special promotions. Check out the events pages of the Cayuga County Office of Tourism or the Auburn Downtown B.I.D. Visit the social media page or website of your favorite local store, restaurant, or business. 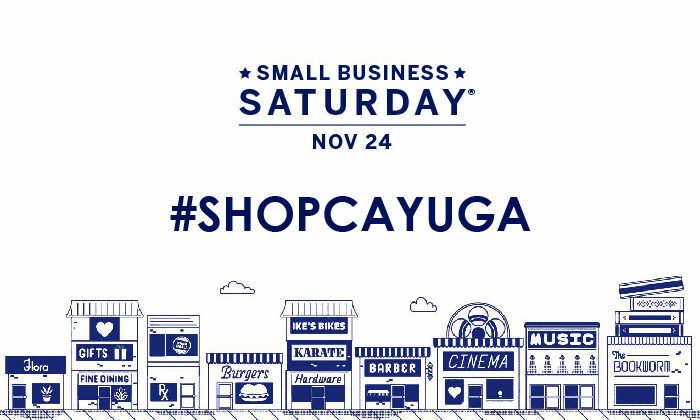 Look for #ShopLocal or #ShopCayuga trends on social media for buzz about the event. Even if a local business isn’t participating, visit them anyway. You might discover a new favorite treat or product made right here in Cayuga County. The positive effects of local spending aren’t exclusive to promotions or to Small Business Saturday. They happen every day, all year round, with every purchase. Shop local, shop small, shop Cayuga County! For more information contact us (315) 252-3500. Published in the November 22, 2018, edition of The Citizen.